There will be no maps for this edition of the IPM Update. State-wide, European corn borer and fall armyworm have declined in the traps. There has been little field activity for either moth. Corn earworm populations have declined, but based upon blacklight information, most areas of the state will need to continue on a 3-day silk spray schedule for late season sweet corn. In the pheromone traps of southern NJ, the number of adult males caught has declined indicating a 4-day spray schedule in most locations. Beet armyworm has been generally low in number throughout the summer season. While there was an increase in trap catches for the Hammonton area this past week, it is not likely to be an economic problem. 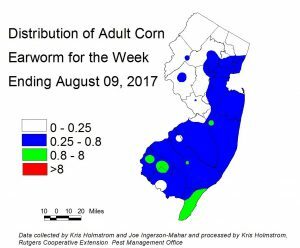 No other field populations have been detected outside of the Hammonton area. This will be the last note for this season regarding pepper weevil. We have been picking up small numbers of HBWW in the blacklight traps, especially in southern NJ, in the past couple of weeks. A field was found this week in Cape May County where the HBWW was abundant feeding on pigweed and sugar beets. The primary host of HBWW is pigweed, but amaranth, spinach, beets, sugar beets, and chard are also fed upon. The greenish caterpillars feed on the leaves and produce loose webbing which pulls leaves together. As the larvae mature they become more reddish with longitudinal stripes. 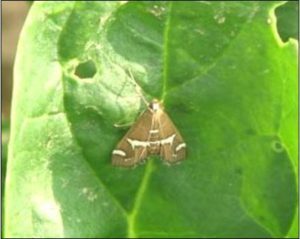 Because localized populations can build up large numbers, farmers should check plantings of susceptible crops for this moth. If spraying is necessary, refer to the Mid-Atlantic Commercial Production Recommendations for control options. An unusual infestation of soybean looper was found in eggplant this past week in the East Vineland area. The caterpillars resemble cabbage looper but have more distinct white stripes and dark margins on the sides of the head. Soybean looper can feed on a wide range of plants besides soybean, including tomato and pepper. 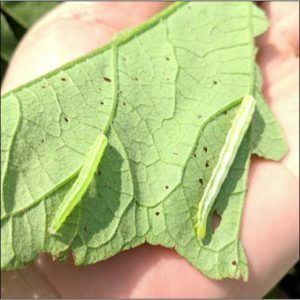 This situation stood out for two reasons: 1) that soybean looper was found in the eggplant, and 2) that any caterpillar infestation was found in eggplant requiring control. In the past, pyrethroid insecticides did very well against corn earworm. But in recent years we have seen the decline in the effectiveness of pyrethroids due to the development of resistance in the earworm population. Farmers who rely heavily on these insecticides run the risk of crop loss. Pyrethroids (IRAC group 3A) can still be used but must be in rotation with materials from other chemical groups, especially groups 5 and 28. Examples of some of these other insecticides include Lannate LV (group 1), Besiege (groups 3A, 28), Blackhawk 36 WG (group 5), Radiant SC (group 5) and Coragen 1.67 SC (group 28). To prevent the development of insecticide resistance and provide for the best pest control, rotate the insecticide groups in your spray program. Do not rely on a single chemistry (mode of action) otherwise crop loss may occur. IPM Program personnel are currently finishing deployment of the black light trap network in New Jersey. At present, we are approximately 70% operational and have begun to monitor traps. To date, no corn earworm (CEW) have been captured. The low numbers of European corn borer (ECB) moths that have been caught do not allow us to produce a map image. As numbers increase, look for population maps of ECB, CEW and CEW catches from pheromone traps in this weekly publication. 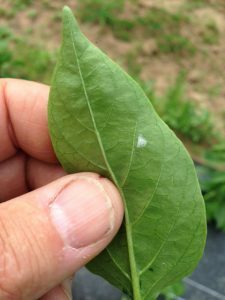 European corn borer egg mass on a pepper leaf. Note: Due to technical difficulties, only sweet corn related maps and information will appear in this edition of the IPM Update. We hope to resume full coverage next week. European corn borer (ECB) adult numbers have again subsided, and no map will appear here. As with last year, the second flight of ECB in New Jersey is low and sporadic. While we are beginning to see limited feeding from this pest, it is relatively insignificant compared to fall armyworm (FAW) feeding that is now occurring on whorl stage sweet corn. Insecticide applications should be made when 12% or more plants exhibit signs of ECB and/or FAW feeding. FAW is, and will remain the dominant pest of vegetative stages of sweet corn for the remainder of the season. Damage is extensive in the southern most counties, while it has increased only slightly over the past week in central and northern NJ. Corn earworm (CEW) catches have gotten slightly more consistent in blacklight traps around the southern half of the state, while pheromone trap catches have risen dramatically in some areas (see CEW blacklight and pheromone trap maps). Growers now treating silking sweet corn should adhere to silk spray schedules to limit damage. With frequent rains, the incidence of rust is increasing in some sweet corn plantings. Additionally, northern corn leaf blight has also been discovered in the northern counties. These diseases can be economically significant, particularly if they first appear in whorl stage plants. Should this situation occur, growers need to consider fungicide applications to limit damage. See the latest Commercial Vegetable Production Recommendations for suitable fungicides on this crop.